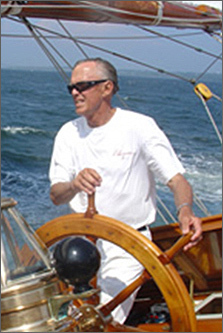 The Corinthian Classic Yacht Regatta presented by Officine Panerai (www.panerai.com), is proud to announce that Halsey C. Herreshoff will be the distinguished speaker at Saturday evening's dinner August 11th. We urge you now to enter this season's regatta and make certain that you make dinner reservations for what will certainly be a fascinating and entertaining evening with Halsey. Last years' event honoring Ted Hood was sold out. This year's Corinthian Classic will be held August 11th & 12th. It is an excellent opportunity to stretch your sea legs, put your beautiful boat on display, and mingle with those who share your passion. Instructions to enter can be found on our website at www.corinthianclassic.org.